The numbers of bikes and trucks are growing in urban areas. Without the recognition of the risk factors associated with their encounters and implementation of relevant countermeasures, this increase could have negative safety consequences. Work at NTNU aims at exploring the infrastructure related risk factors within urban areas. It applies several methods, such as accident data analysis, internet survey of cyclists, interviews with truck drivers and logistics managers, and analysis of video recordings of traffic, in order to identify improvements to urban infrastructure. 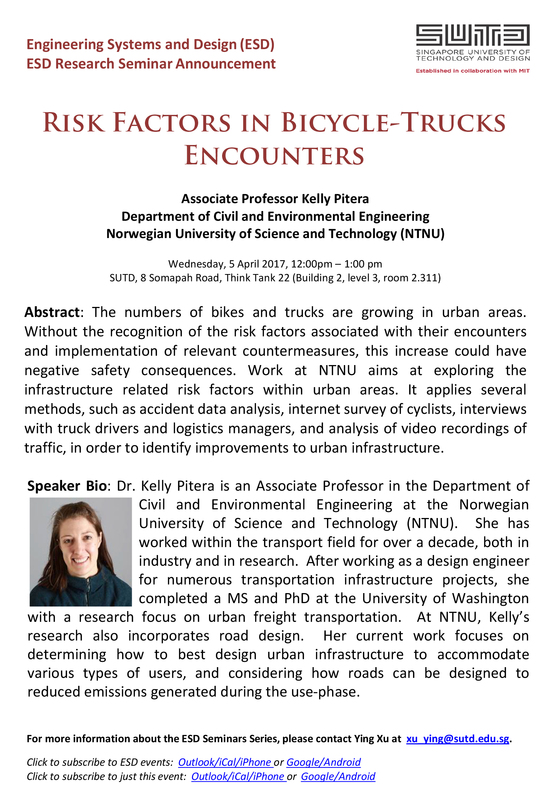 Dr. Kelly Pitera is an Associate Professor in the Department of Civil and Environmental Engineering at the Norwegian University of Science and Technology (NTNU). She has worked within the transport field for over a decade, both in industry and in research. After working as a design engineer for numerous transportation infrastructure projects, she completed a MS and PhD at the University of Washington with a research focus on urban freight transportation. At NTNU, Kelly’s research also incorporates road design. Her current work focuses on determining how to best design urban infrastructure to accommodate various types of users, and considering how roads can be designed to reduced emissions generated during the use-phase. For more information about the ESD Seminars Series, please contact Ying Xu at xu_ying@sutd.edu.sg.